County Commissioners Linda Modrell and Annabelle Jaramillo listen to a speaker on the Bailey Branch plan Thursday. Some Benton County farmers and others have all kinds of reasons to oppose turning the old Bailey Branch rail line into a trail for hikers and bicycle riders, but the objections raised at a hearing Thursday all have answers. 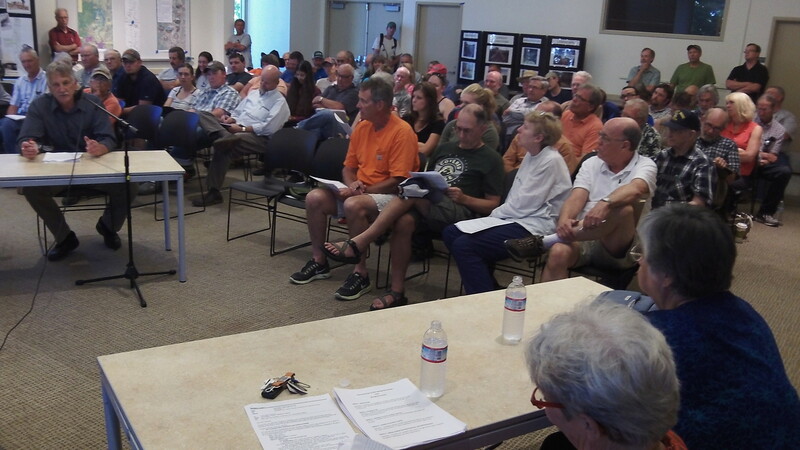 About 60 people turned up at the Corvallis library for the second of two hearings to gather public comment on a county “strategy” for managing the 18 miles of rail corridor. The Portland & Western and the Union Pacific had abandoned the line, which runs from Greenberry Road south to Monroe and from there to Dawson. Last year the Benton County commissioners, wanting to preserve the corridor for potential future rail use, bought it for $486,000. The cross ties and rails are being taken up, and now the question is what to do with the land in the meantime. One option is to turn it into a trail. Trail users would raise a fuss about dust or spraying that are part of normal farm operations. But those things are temporary, seasonal and often brief, and mid-valley residents are used to them as they drive on county roads. Where would cyclists relieve themselves out on the trail miles from facilities? How about an occasional porta-potty along the line where it crosses a public road? What about security? Who would make sure trail users are safe, and how would an ambulance reach them if they needed one? Who makes sure trail users are safe in the middle of McDonald Forest, where trail accidents can happen far more frequently than on a straight and level trail. The fear of vandalism figured in many comments. But according to one experienced user of rail-trails all over the country, if vandalism happens it’s sometimes done by opponents sabotaging trails, by burning trestles for instance. Some suggested the land should be sold and the proceeds used to build trails elsewhere or widen Bellfountain Road to make it safer for cyclists and walkers. But this ignores the unique appeal of rail trails: Their very gradual grade and lack of sharp turns make them easy for people of all abilities and ages to use. Somebody worried about trail users starting fires by tossing away lighted cigarettes, and one backed this up with a story of seeing a kid about 13 coming down the rail corridor on a bike and smoking. (That would have been a bumpy ride even if the ties had already been removed.) A rail trail is no guarantee against careless smokers using it, but the risk of an actual hiker or cyclist on a ride lighting up is remote. Somebody else said there is plenty of hunting along the rail corridor and trail users might get shot. If cyclists or hikers worry about this, maybe they can wear blaze orange. Or go elsewhere during the season. The comments went on for an hour and a half. County Commissioner Annabelle Jaramillo says she hopes a plan can be adopted before fellow Commissioner Linda Modrell retires at the end of this year.